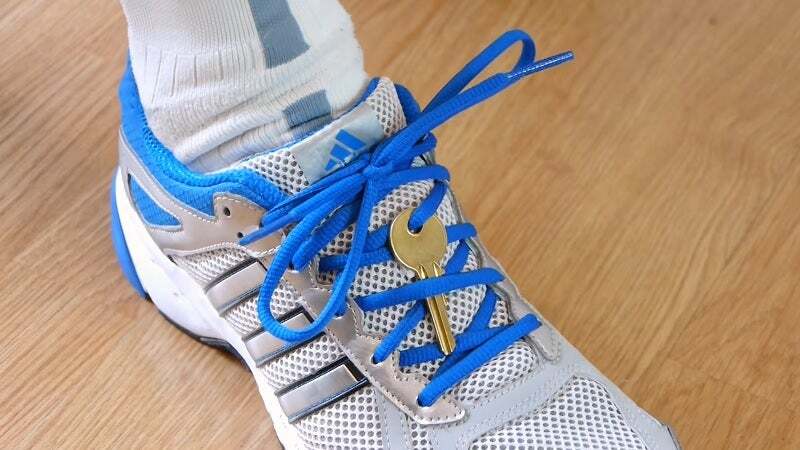 If your running gear doesn't have any pockets for storing your key, use your shoes. Your laces will keep it nice and safe. The last thing you want is to lose your house key on a run. If your gear isn't suited for storing things safely, you can try a hide-a-key, but that's not ideal for some environments. That's why youtuber DaveHax recommends you tie your house key right into the laces of your shoe. It will be easy to get to when you need it and there's no risk of it falling out of a pocket as you jog along. Just be sure you unthread one of your laces down a notch before attaching your key and re-threading. Otherwise your key could go flying if your shoelaces get untied.